It’s been a while since I did a proper piece regarding Shovel Knight so with the game now on its way to Japan, (to be released in June on both the 3DS and Wii U) thanks to Nintendo, so now is as good a time as any to write about its success! 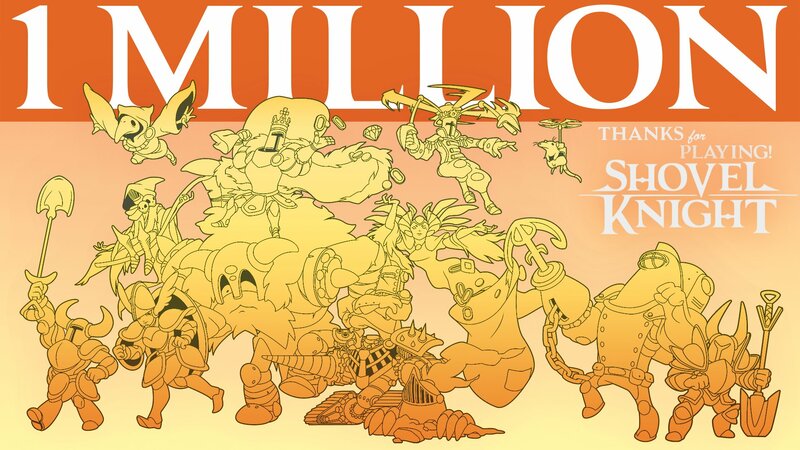 Since its initial release back in 2014, the game has gone on to make 1 million digital sales and 1.2 million overall sales which includes physical copies, and means 1 in 6 players who brought the game, actually own a hard copy of it, so if you’re one of these few, give yourself a pat on the back. Then there’s also reasonably well success of the official Shovel Knight amiibo, which as a lesser character and in no way as large as all the other amiibo characters we’ve seen, has made over the 180,o00 sales since the 8th of January, 2016. It’s also a game that has not only been nominated for 100 rewards according to Yacht Club Games’ website and the infographic you can find near the bottom of this piece, but actually walked away with 84 of them. But the road to success is never an easy one, and the small staff of Yacht Club Games really did learn this the hard way, but it has all been worth it in the end. Even the additional content such as the Plague Knight: Plague of Shadows campaign, (which in my opinion is a full game in its own right, so buying the Shovel Knight came is essentially buying two good games for the price of one,) was no small feat either as it went on to cost 1 million dollars to do, which took over a year to do with a staff of eight people working on it around the clock. This campaign mode, which as mentioned above, is free and can be undertaken once beating the normal campaign on Shovel Knight and as a free dlc, it means the staff who worked so hard on it, worked their butts to the bone with the intention of getting nothing in return and they are still aiming to bring two more full campaigns to the game with all of this mind. Yacht Club Games and Shovel Knight just keep on giving back at every opportunity, it’s probably this reasons, among many others, why we love them so much. And as a further treat, there will be new themes available too for the PS4, PS Vita and Nintendo 3DS. If you’re hoping to grab one of the new themes for your handheld, (entitled “Shovel Knight Campfire Dream” and Plague Knight’s Theme,) they release on the 28th of April in North America and the 13th of May for Europe and now with that out of the way, it’s time to let the official infographic do the rest of the talking and should you find yourself wanting even more details, be sure to click on the source article as it will take you to Yacht Club Game’s post regarding all of this and more! We have a lot of love for Shovel Knight here at Miketendo64 so if you’re in the mode for some more reading, be sure to check out our reviews on both the Shovel Knight and Plague Knight campaigns, by clicking here and here. But great job as always Yacht Club Games, you guys rock! I had fun working on this piece and sharing in on Yacht Club Games and Shovel Knight’s success, so to see this on Twitter really made this whole experience all the more enjoyable.